slight aside, here, but it looked like BW was wearing a skinsuit of a similar style to the ones sky wore a couple of years ago, with a very prominent wire/seam at the front of the arm. I thought these were illegal, and hence why sky didn't wear them anymore. with regards to legal or illegal components. I'm sure the custom TT bars are intended to be illegal when the rules were written (about everything being commercially available) but British Cycling have long flouted this by pretending to sell their stuff to anyone who pretends they want to buy it. Bradley Wiggins position in the hour record it's illegal, the position was banned immediately after Floyd Landis used it in the TdF 2006, arm should be horizontal. I guess rules don't apply for Wiggins, first ar the Tour of Yorkshire and now in the hour record. Brain Cookson is worth then Pat McQuaid. The complaints from people peripherally associated with Dowsett's camp are nothing but hot air. The attempt never would have gone ahead without UCI approval of the bike and the skinsuit. I do think that Sky/BC push the boundaries when it comes to equipment. The rules are supposed to be that it must be commercially available, and that simply aint the case with their equipment. But that is something the UCI should be pulling up BEFORE the attempt. Not for others to use to slag him off afterwards. Yeah this is always how BC have done it, I remember some brouhaha around the skinsuits they used in London too. The 'commercially available' rule turns out to be pretty lenient, you have months and months after the fact in which to meet it and you might only have to sell one of each piece of equipment to be safe. I read that Canyon made nine bikes for Dowsett's attempt and plans to sell at most two of them. Why is there even such a thing? It holds zero relevance in the big picture. The Hour Record really needs to be all or nothing. Isn't that the whole point? Bradley Wiggins is the man to beat. Period. The same way there are world and national records in virtually any other timed athletic discipline, there are national Hour Records as well. So who next for an attempt on the real record - passed mr dowsett driving in opposite direction earlier tonight - another go? Just want to say good luck to Colin Lynch on his attempt in Manchester today. Well done that man, smashed it. Reigning Danish ITT champion Martin Toft Madsen set a new Hour Record, smashing Ole Ritter's 1974 distance of 48.879 km (which was the World Hour Record at the time) and posting 52.114 tonight as part of the Copenhagen Sixdays program. And he's said that he will try to go after Wiggins' mark of 54.526 at some point in time too. “I do not have the illusion that I am a better cyclist than Wiggins. But I know that Wiggins did his record under conditions that were not ideal, [...] the Hour Record was not as quick as it could have been. There is a window of opportunity and we want to crawl through it. Wonder if Dowsett's iminent transfer means that his November attempt is on hold - possibly indefinitely if he really makes the progression to full time Dom next season rather than light Dom and occasional ITT er ? Dowsett had been scheduled to have a second tilt at the World Hour Record, which he lost to Bradley Wiggins in 2015, this year but that has been cancelled. However, he is still keen to reclaim it though he has not had any detailed discussions directly with Katusha. It seems that Danish National Time Trial Champion Martin Toft Madsen made an attempt in Mexico today but came up short. He was about 900 meters off the record of 54.526 km. Toft Madsen finished at 53.63 kilometers. I can't find anything in English about this, so maybe someone else can provide more info. I did, however, come across one great Google translation. 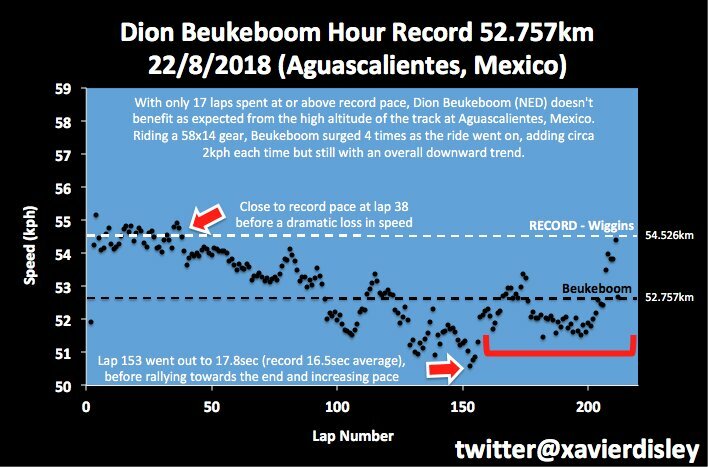 Dutch rider Dion Beukeboom will apparently be making his run at Wiggins' record on August 22 at the Mexican Velodromo Bicentenario in Aguascalientes (which is where I believe Toft Madsen made his attempt today?). Beukeboom has already announced its attempt some time ago, but the UCI is now reporting that all data are in jugs and jars. I've no idea what that's supposed to mean. Apparently there was a live Youtube feed of today's attempt, but I hadn't seen a word about it. It was live on Danish TV, but even I only learned about it a few days ago, mostly by accident. Danes, if their last names is a patronym (finishes in a -sen), are virtually always always referred to by their middle name (or middle name + last name) to avoid confusion with the millions of other Madsens, Hansens, Christensens etc. So, not Madsen, but Toft (or Toft Madsen). 52.757 km for Beukeboom. New record, but far off challenging Wiggins' mark. 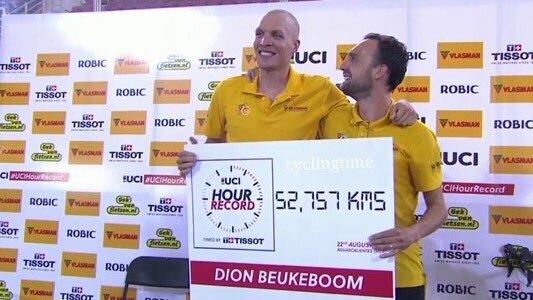 Feels to me like this is just a 'test event' to see how far he is from the Hour Record with top condition (a week after the Worlds), but without any specific training. He might still surprise, but it's unlikely he'll break Wiggins' mark. Huh. I'm always rather shocked when media outside of the cycling world even notices. It'd be fun to be able to go through the level of analysis that the guy in this video did.